The post How to Understand and Help Your Noise-Phobic Dog by Dr. Ernie Ward appeared first on Dogster. Copying over entire articles infringes on copyright laws. You may not be aware of it, but all of these articles were assigned, contracted and paid for, so they aren’t considered public domain. However, we appreciate that you like the article and would love it if you continued sharing just the first paragraph of an article, then linking out to the rest of the piece on Dogster.com. I looked disbelievingly at the mellow Maltipoo at my feet, who apparently mutated into Mad Maxipoo whenever thunderstorms, fireworks, roaring engines or other unexpected loud noises occurred. If Maxine was home alone when she became frightened or anxious, well … tornados and torn blinds resulted. 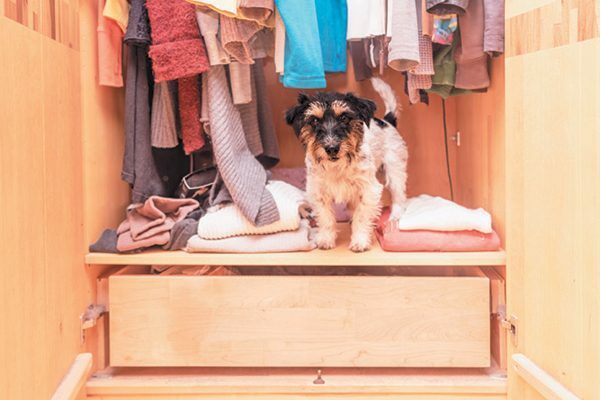 A safe place like a bedroom closet can help ease anxiety. Photography ©K_Thalhofer | Getty Images. Noise phobias and sound anxieties affect up to one-third of all dogs. Thunder booms, dropped dishware, sirens and bass-heavy loudspeakers can cause some dogs to wildly flee, hyperventilate, desperately howl and bark, or even lose control of their bodily functions. Maxine exhibited nearly all of these symptoms, including destroying anything she could get her paws on. Most noise-phobic dogs have experienced some sort of psychological trauma, especially during puppyhood. They may associate a loud bang with an injury, a crack with punishment or simply fail to comprehend that distant booms pose no real threat. Novel or previously unheard intense sounds such as a violent thunderstorm or loud construction may trigger an instinctive urge to flee or physiological stress response. Older dogs may have changes in their hearing that also contribute to noise phobia. Certain injuries or chronic and severe ear infections may alter sound recognition and lead to behavioral problems. Rarely, brain or ear tumors can cause sudden, inexplicable aversions to particular volumes or tones. If your dog becomes afraid of certain sounds, the first step is to contact your veterinarian to rule out a medical condition and explore the origins of a noise phobia. I thoroughly examined Maxine and couldn’t find any physical cause for her behavior. I began explaining noise phobia because I was also concerned Maxine would become injured during one of her anxious episodes. pharmacological interventions, most notably SSRIs (selective serotonin reuptake inhibitors), such as Reconcile (fluoxetine) treatment combined with behavioral modification. These treatments, both alone and in combination, have eased anxiety in countless canines confronting noise phobia. But what about the dog who only rarely experiences a fear of loud noises? There’s also a medication that can help with that. Sileo (dexmedetomidine oromucosal gel), is the first and only medication approved by the U.S. FDA for treatment of noise aversion in dogs. This treatment is particularly helpful because it doesn’t sedate the pet when used at label dosages. It’s also easy to administer because it’s a gel you squirt along the cheek and gums. No struggling to pop a pill or conceal a capsule. Sileo is intended to work when you need it. If you know fireworks or loud noises will begin at a certain time, administer it 30 to 60 minutes beforehand to help ease fear and anxiety. According to studies, each dose lasts two to three hours, usually long enough to get through most firework celebrations and storms. If necessary, you can repeat the drug up to five times, providing up to 15 hours of help. This drug isn’t suitable for every dog and doesn’t aid every situation. The FDA cautions against using Sileo in dogs with “severe cardiovascular disease, respiratory, liver or kidney diseases, or in conditions of shock, severe debilitation or stress due to extreme heat, cold or fatigue or in dogs hypersensitive to dexmedetomidine… .” You also shouldn’t give Sileo to a pregnant or lactating dog, or a dog used for breeding. I recommended Maxine begin a simple sound desensitization program using storm, fireworks, gunshots and other offensive noises we found on the internet at gradually increasing volumes. When the owner played the sounds, she taught Maxine to go to a “safe place” bed where she gave her treats and praise. We also began using dog appeasing pheromones in diffusers placed throughout her house and liberally doused bedding with lavender. I prescribed Sileo to use whenever a storm or holiday noise event occurred. I asked to see Maxine again in one month to check on her progress. “I’m happy to report no torn blinds or tornados!” Maxine smiled at me as her owner gave me this update. Maxine was responding well to the behavioral modification, completing three or four 10-minute “sound sessions” each week. As a veterinarian, the pain of witnessing a dog in fear is nearly unbearable. I’m constantly seeking better ways to relieve anxieties and phobias in my patients. If your dog is one of the millions suffering from noise phobia, talk to your veterinarian. Thumbnail: Photography ©alexkich | Getty Images. Dr. Ernie Ward is an internationally recognized veterinarian known for his innovations in general small-animal practice, long-term medication monitoring, special needs of senior dogs and cats, and pet obesity. He has authored three books and has been a frequent guest on numerous TV programs.